Marko Batista will premiere his new intermedia performance continuing his experimental audio-visual explorations from the series of projects entitled "Displaced Objects and Hybrid Structures ". Using technology, the author focuses on shaping a hybrid environment of non-linear structures and displaced matrixes. Particular audio systems form a so-called network of travelling objects and, through the use of modern realtime technology, intertwine with temporary digitally generated visual processes. Besides an experimental approach and a succession of visual images, Batista's intermedia performance offers a specific spatial experience of audio sequences that are intricately intertwined and generated from low-frequency electromagnetic spectres. Using specially made electronic tools and control elements, the author forms a platform that enables a rhizomatic environment of hybrid displaced units. MARKO BATISTA is Ljubljana based mixed-media artist born in Tito's Yugoslavia. At the end of the year 1997 he is accepted to ACADEMY OF FINE ARTS in Ljubljana under the guidance of professor BOJAN GORENEC. The result of collaboration with professor Borut Vogelnik, Bojan Gorenec, Joze Barsi, Sreco Dragan and artists Vasja Lebaric, Andrej Kamnik was a participation at the LA BIENNALE DI VENEZIA 50th International Art Exhibition: VV2 in June 2003. Texts, discussions and photo documentation was published in a book entitled PHOTOFINISH (Batista M., Kamnik A., Lebaric V.; 2004) in collaboration with Tomaz Kucer. In 1998 together with Miha Horvat (son:DA) founded multimedia group KLON:ART:RESISTANCE. Exploring moving images and digital sound environments they presented several projects at festivals, galleries and different urban places.In December 2000 FORUM STADTPARK (Gratz - Austria) and MKC Maribor invited Klon:Art:Resistance members in Gratz as a part of the introducing young conceptual artists of slovenian contemporary video art. 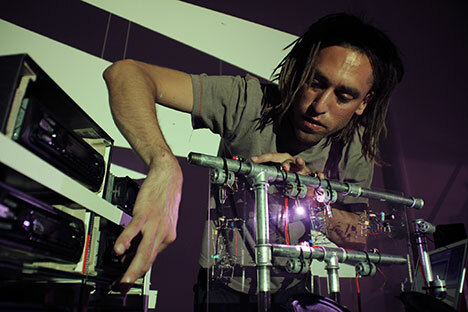 As mixed media artist he is interested in image transformation processes, technology, networking data, sound layering and displaced sound-scapes, collaboration, linking concepts, hybrid spaces, contemporary society, diversity of art systems, politics of art and other fields of contemporary mixed media art.